Strophostyles umbellata,© Copyright Sheryl Pollock.www.discoverlife.org. (Accessed 9/2014). Strophostyles umbellata is a perennial, twining vine, to 1 m in low vegetation. Leaves alternate, 3-parted, leaflets 2-5 cm, egg-shaped, not lobed, hairy below, dull dark green above. 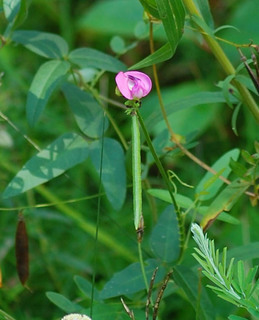 Flowers pink, to 1.4 cm long, pea-flower-shaped, keel petal strongly curved into a beak, calyx hairy, irregular, 4-lobed, lowest lobe longer than others; inflorescence of small clusters on a long stalk; blooming July-Oct.
Fruit dry, hollow pods, cylindrical, about 5 cm long, seeds to 0.5 cm. Frequency in NYC: Rare (NYS S1, U).